For San Jerónimo Aculco, the former village now part of Mexico City, see San Jerónimo Lídice. 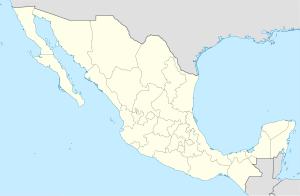 Aculco de Espinoza is a town and the seat of the municipality called Aculco in Mexico State. Aculco was founded approximately in 1110 AD by the Otomies, despite the fact that its name comes from Nahuatl. After being a village inhabited by Otomies for long time, it became a region dominated by the Mexicas, who lived there many years before the founding of Tenochtitlan. With the arrival of the Spanish in 1540, construction on the church and the convent of San Jeronimo began. In November 1810, Miguel Hidalgo and his contingent, who began the Mexican War of Independence, arrived in the region. Aculco was also where insurgents, led by Don Miguel Hidalgo, lost a battle against the troops of Felix Ma. Calleja. During the nineteenth century, the town hall and the first primary school in the region were constructed. Public baths and a municipal pool were also built. Aculco currently has a population of over 40,000 people. On February 19, 1825, it became a municipality. In 1914 and 1915, Aculco was the scene of clashes led by the revolutionaries’ carrancistas, villistas and Zapatistas. The municipality of Aculco has a geographical extent of 484.7 square kilometres (187.1 sq mi). That represents 2.18% of the state. It is located in Mexico State. Aculco borders Polotitlán in the north, Querétaro in the south, and Acambay and Timilpan in the south. It is approximately 100 kilometers away from or over 1 hour from Toluca, Toluca. Aculco has a relatively cool, humid climate, with rain in the summer. The annual average temperature is of 13.2 °C (55.8 °F), with the lowest temperature occurring in the winter. The rain season starts at the end of March or beginning of April and lasts until October or November. According to INEGI, in 2005, Aculco has a population of over 40,000. The ethnic composition is mainly Otomi. Over 16,000 people in the region are illiterate. The main economic activity of Aculco is the ranching of animals like pigs and sheep. The municipality's principal products include milk, fur, wool and egg. Aculco's inner commerce principally occurs at the municipal market, while its outer commerce is with Toluca, Mexico City and Querétaro. Another major economic activity of Aculco is the exploitation of natural resources like sand, with quarries present in the region. Aculco is famous for the dairy products it produces. The municipality is also home to a metal structure manufacturing company. Aculco contains numerous geographic features suitable for tourism. Two cascades are located in the area: "Tixhiñu" and "la Concepción". Many rivers, including the Río Ñadó and Río Prieto also flow through the municipality. In addition, Aculco is home to numerous historic sites, including the San Jerónimo and the "Garrido Varela" (a bullring), as well as the former residence of Miguel Hidalgo y Costilla. Two busts are located in Aculco in the memory of Benito Juarez and Miguel Hidalgo. ^ a b c d e f g h i j "Enciclopedia de los Municipios de México". Archived from the original on 2007-09-30. Retrieved 2008-01-26. ^ a b "Aculco". Archived from the original on 2007-09-07. Retrieved 2008-01-30. ^ "Sitios de México". Archived from the original on 2009-12-05. Retrieved 2008-01-31. ^ Gaspar Sampayo, Domingo. Monografía Municipal - Aculco. Mexico: Gobierno del Estado de Mexico. ISBN 968-841-079-9.